There are few aspects of our built environment more emotive that that of the entrance door. It can mean shelter, warmth, food, security, friendship. All of life involves the act of entrance, from the earliest caveman to the present day. How many times per day do we go in and out of buildings and our homes? We scarcely stop to think about it, yet entrances all convey subconscious messages which can affect us on deeper levels, for good or ill. Some doorways are enticing, friendly; some oppressive; some just dingy and neglected. Most are probably functional and non-descript, of itself a message just as powerful as the others. We move from our homes to cars, to shops, offices or other houses. Each time we do this we experience a subtle shift in light levels, humidity, warmth, expectations and intentions. Our mood shifts and adjusts with our purpose and our expectations. Going to work we might subconsciously don a mask as we enter busy offices or a large railway station. Arriving home again, we relax as we walk up the path, shedding the mask as we close the door behind us. The physical structure of a building and its entrances tell us what to expect: grand doorways with tall columns tell us of status, power and authority. Grim entrances to prisons have an unmistakable message. In public buildings especially, proportion is everything, where tall ceilings and doors give formality. By contrast a humble cottage door or an old garden gate recessed into an ivy-covered wall might look secretive or inviting, asking us to explore the spaces beyond. What do the doors to our homes tell us? Most front doors are rather bland or feel inauthentic, for example the many mock-Georgian style doors on modern houses offer us nothing more than a thin veil of pseudo-style applied over a nondescript structure. In the home, layout and door position is also important. The front door is our formal entrance to the world, the back for our private comings and goings. Yet how many house layouts truly observe such simple criteria? Some houses have both the front and back doors equally visible, with no clear indication as to which is which. Or the back door opens onto a narrow side passage, rather than directly onto the garden. Many of us live with awkward house layouts. Overcoming the problem of awkward flow is, however, fundamental to the harmonious functioning of a house and its occupants. On occasions when looking at a house and the way it connects to the garden, I have recommended the re-location of the rear door. It sounds extreme but I have had several clients who were very glad they took my advice. Fundamental problems sometimes need bold solutions and the picture below is one such example. Here, a new connection from kitchen into the garden via a (new) seating area made a big transformation. French or patio doors aren’t always the bonus they’re meant to be, though. Sometimes these confuse the traffic-flow and can destroy the usability of the room in which they occur. Lines of movement (inside or out) should not cut through a still-point. Of course, sliding doors which truly open up the house and invite a more relaxed transition can be fantastic. It’s all down to careful thought and good design. So much for placement, what of the physical act of entering and leaving? All too often it’s a bit, well, abrupt. Ground and wall meet at the perpendicular, at which point, there’s a door. You open it, go in or out. That’s it – all over with. Yet it takes a moment to adjust, from one environment to another, both physically (light and warmth) and mentally (tasks, purpose, relaxation). Ideally therefore, we need a space in which to adjust, to experience transition, even if it’s for just one second. 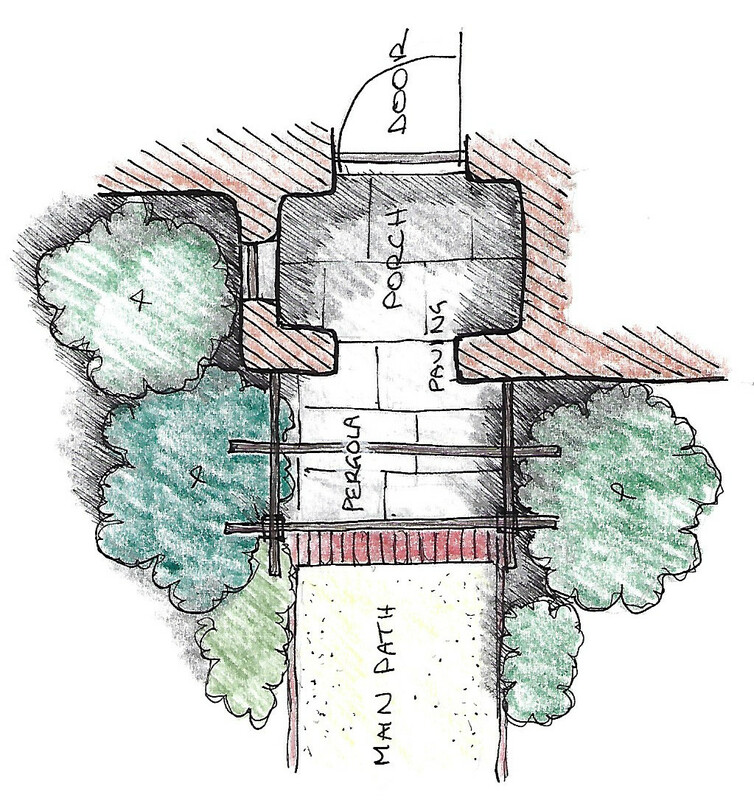 That space becomes an area that is “in-between” – it could be a porch to the front entrance or a pergola to the rear. 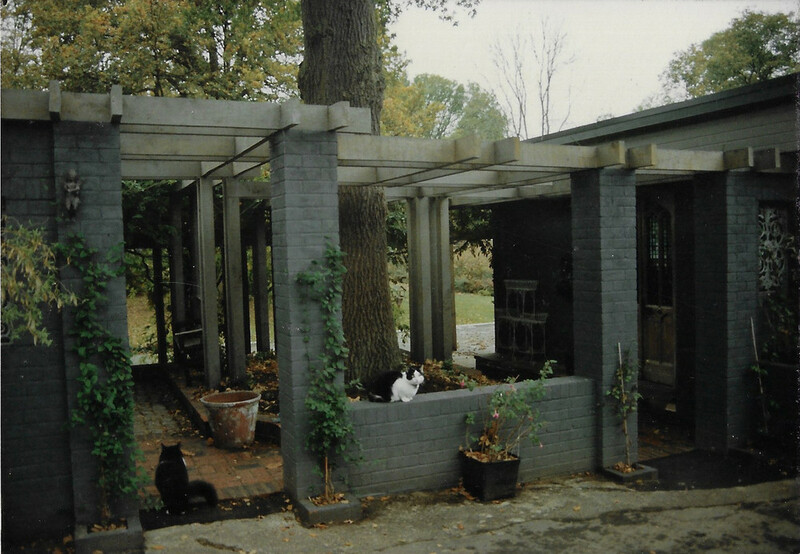 A covered walkway might lead to the car, a path or set of steps might connect us to the garden. How this transitional space is styled will of course depend upon its use. For a front door, nothing beats a good porch or recessed doorway. The visitor waits in this transitional space for the door to be opened, the owner pauses to find their keys. Both might be glad to be out of the rain, or bathed in a welcoming light at night. Where possible, the porch should be preceded in the approach by a path and suitable planting, building up the sense of arrival. In these days of open-plan front gardens, attention to these simple things can make a big difference. Where a door fronts onto a street, a roof canopy over the door and some tubs or wall planters might serve. A step up onto a different level might be frowned upon by planners, but where disabled access is not an issue, a step up, off the pavement can make a huge difference – suddenly we are in stasis, out of the busy flow of the main path. To the rear, where a door connects you to the garden, there are multiple ways to enrich the experience of transition. 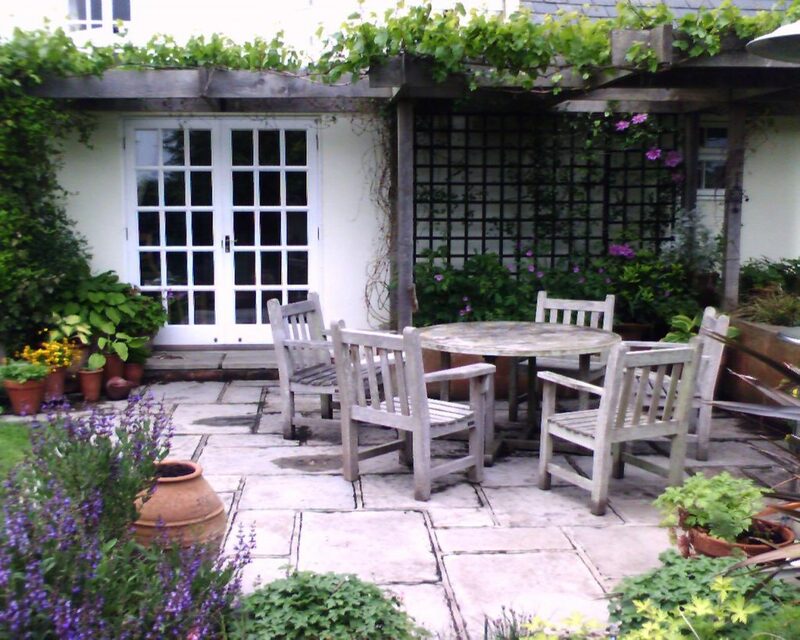 A pergola might frame a door and be part of a larger structure which defines an outdoor room. Conservatories and lean-tos might be the connecting space. Loggias and verandas make a great transitional area. Where the back door has to be to the side of the house, perhaps make a shady passage covered by pergola, with ferns, foliage and climbers to give dappled light. Choose a good brick or stone and make it feel like a tunnel leading out into the garden proper. So think about the way you move in and out of your house. Imagine the use, mood and character you wish to create and then find the structure to answer that need. A good entrance can really root a building into its environment and enhance the user experience considerably. If a building feels settled, like it belongs, you will too. Don’t put up with the merely adequate – enrich that transitional moment and rediscover the lost art of entrance.